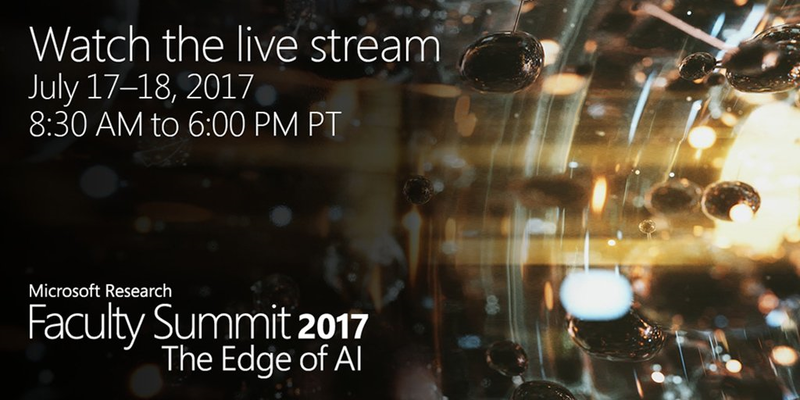 Join us on July 17 & 18 for the live stream of the Microsoft Research Faculty Summit 2017: “The Edge of AI”! The 18th annual Microsoft Research Faculty Summit in Redmond, WA on July 17 and 18, 2017 will consist of a variety of keynotes, talks, panels, and technologies focused on Artificial Intelligence (AI) research: The Edge of AI. Microsoft AI researchers are striving to create intelligent machines that complement human reasoning and enrich human experiences and capabilities. At the core, is the ability to harness the explosion of digital data and computational power with advanced algorithms that extend the ability for machines to learn, reason, sense and understand—enabling collaborative and natural interactions between machines and humans. The Microsoft Research Faculty Summit 2017 will bring together thought leaders and researchers from a broad range of disciplines including computer science, social sciences, human design and interactions, and policy. Together we will highlight some of the key challenges posed by artificial intelligence, and will identify the next generation of approaches, techniques, and tools that will be needed to develop AI to solve the world’s most pressing challenges.